in next sc, * rpt from * to * to last dc, hdc and sc, skip 1dc and hdc, 1sc in last sc. Turn. 35 More rows in Main Color. Fasten off. Turn. 1 Row in contrast color. Fasten off. Turn. 2 Rows in Main Color. Fasten off. Turn. 6 Rows in Contrast Color. Fasten off. Turn. 37 Rows in Main Color. Turn. You should have now worked 86 rows in all. row end to last corner, 1sc in base of ch1 on corner, sl st to first sc. Turn. around towel to end, sl st to first sc. Turn. Fastening off between colors, rpt last row twice more in Contrast Color and twice more in Main Color. Fasten off. Finishing - Sew in and tie off loose ends of thread. Rpt Pattern Row from Kitchen towel in main color until 30 rows have been worked in all. Turn. end to last corner, 1sc in base of ch1 on corner, sl st to first sc. Turn. around cloth to end, sl st to first sc. Turn. 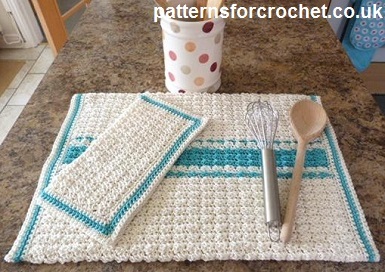 Hope you enjoy this Free Crochet Pattern for Kitchen Towel & Dishcloth.